Located in Northwest Chicago approximately 17 miles from downtown, O'Hare is one of the world's largest and busiest airports. This complex facility is made up of three domestic terminals, one international terminal, a main parking garage and numerous parking lots. A light rail transit system, linking the terminals and economy parking lots, is wheelchair accessible with elevators at each stop. Information-Airport information booths (with high counters) can be found on the lower level of Terminals 1, 2 and 3 and on both levels of International Terminal 5. Information for travelers with disabilities, including a new access guide, is available on the airport's website and by calling 773-686-8040. Pick-Up/Drop-Off Zones-Designated loading zones with level access and curb cuts are located on the lower level adjacent to each domestic terminal and in Parking Lot D adjacent to the international terminal. Curbside check-in is available. Entrances have automatic doors. Parking Facilities-The elevated parking structure (Lot A), adjacent outdoor lots (Lots B and C), the parking lot serving the International Terminal (Lot D), and Economy Lots E and F have 250 accessible parking spaces. For further information, call the Parking Information Hotline at 773-686-7530. Mobility-Wheelchair access at O'Hare is generally good and continues to improve as renovations and expansions take place. Parking, elevators, phones, restrooms, restaurants, bars and shops meet most access standards. Hearing-Visual paging is available only in International Terminal 5, adjacent to flight information monitors. Each phone bank has a volume control phone. Public TTY's are located on the upper and lower levels of each terminal and on each domestic concourse. Video pay phones are also available in terminals and baggage claim areas. Vision-Directional and informational signs are large print, high contrast and non-glare. Braille and tactile signage identifies most restrooms. Elevators have audible signals and Braille/tactile signage for controls and hoistways. Airport information is not available in alternate formats. None of the restaurants or bars have Braille or large print menus. Dog Relief Area-Animal relief areas are located curbside, on the lower levels of Terminals 1 and 5. They are gated areas designated for service animal relief and are accessible at all times. All animals must be accompanied and leashed by the owner. Medical Facilities-UIC Medical Center runs a first aid center in Terminal 2, upper level. Defibrillator units are located throughout the airport within a 1 minute walk from all points. Airline Services-All airlines provide wheelchair escorts on request, as well as escorts for passengers who are blind or have cognitive disabilities. American and United use electric carts on their concourses. Except for smaller commuter aircraft, all boarding is by jetway. Contact individual airlines for details. Smaller than O'Hare and recently redeveloped, Midway is located in Southwest Chicago about 10 miles from downtown. Facilities in the new, 3-level terminal building are very accessible. Free lift-equipped shuttle buses connect the economy parking lots with the terminal and run every 15 minutes. For special assistance with parking accommodations, call the Parking Information Hotline at 773-838-0756. Information-Airport information booths with lowered counters can be found in the upper level check-in area and the Midway Boulevard restaurant and shopping area. 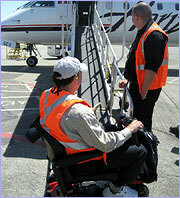 Airport access information is included in a new access guide, also downloadable from the airport website. Pick-up/Drop off Areas-There are designated accessible drop-off areas on upper and lower levels of the terminal roadway. Security guards allow extra time for persons with disabilities to load and unload. Curbside check-in is available. Entrances have automatic doors. Parking Facilities-There are two parking facilities at Midway airport: Terminal and Economy parking. Both of these garages have designated parking spaces for motorists with disabilities located near each of the three elevator cores. Passengers should use the center core elevators to reach the third floor to access the pedestrian bridge to the terminal building. The Economy lots (Red and Yellow) have designated parking near the entrances. Free shuttle buses, equipped with wheelchair lifts provide transportation between the economy lots and the terminal every 15 minutes. For special assistance with parking accommodations please contact the Parking Information Hotline at 773-838-0756. Mobility-Wheelchair access at Midway is excellent. Parking, elevators, phones, restrooms, restaurants, bars and shops meet almost all access standards. Unisex accessible restrooms are indicated on the map. Hearing-Each phone bank has a volume control phone. Public TTY's are located throughout the terminal and concourses and indicated on the airport map. Video pay phones are available in the terminal and baggage claim area. Midway has no visual paging system. Vision-Directional and informational signs are large print, high contrast and non-glare. Braille and tactile signage identifies all restrooms. Elevators have Braille/tactile signage for controls and hoistways; recorded announcements were recently added. Airport information is not available in alternate formats. None of the restaurants or bars have Braille or large print menus. Dog Relief Area-The Animal Relief Area is curbside, on the lower level to the side of the terminal near Door 1. It is a gated area designated for service animal relief and is accessible at all times. All animals must be accompanied and leashed by the owner. Medical Services-Defibrillator units are located throughout the airport within a 90 second walk from all points. Airline Services-Electric carts are not used on the concourses but there are moving walkways. All airlines provide wheelchair escorts on request, as well as escorts for passengers who are blind or have cognitive disabilities. Except for smaller commuter aircraft, all boarding is by jetway. Contact individual airlines for details.